April is water conservation month for Hillsborough. Let’s do our part to utilize our resources effectively. HB 985 is a local bill sponsored by Representative Rachel Burgin (Hillsborough Co.) on behalf of Hillsborough County that would extend the sunset of the Economic Development Department’s successful Payment and Performance Bond Waiver Program to the year 2016. Working in partnership with the Florida Surety Association and local financial institutions, the programs has assisted 69 small and minority‐owned businesses to obtain training and experience on numerous government capital projects necessary to grow and qualify for large scale construction projects in the future. The bill passed its second of three committees of reference, the House Government Operations Subcommittee by a vote of 12‐0 on Tuesday, March 29. The bill has one remaining committee reference. Hillsborough County staff will continue to provide needed support and information to ensure its successful passage. To recognize and honor law enforcement officers who recently lost their lives in the line of duty, Senator Jack Latvala and Senator Arthena Joyner (both representing Hillsborough County) are sponsoring SB 782 that designates State Road 583/North 50th Street in Hillsborough County from Melbourne Blvd/East 21st Avenue to State Road 574/Martin Luther King Jr., Blvd is designated as “Officer Jeffrey A. Kocab and Officer David L. Curtis Memorial Highway”. Officer Jeffrey A. Kocab joined the Plant City Police Department in 2005, and later joined the Tampa Police Department in 2009. During his years as a police officer, Officer Kocab was decorated with multiple awards as employee of the month and Officer of Year in 2007 and 2009. Officer David L. Curtis served in the Tampa Police Department for over 3 years. In 2007, Officer Curtis was named Officer of the Month for his dedication involving a child neglect case. Officer Jeffrey A. Kocab and Officer David L. Curtis were killed while attempting to make an arrest at a traffic stop. Officer Kocab is survived his wife, Sara. Officer Curtis is survived by his wife, Kelly, and four sons. The bill has passed all three of its committees of reference by unanimous votes, including the last, Senate Rules Committee, by a vote of 12‐0. It is now available for consideration by the full Senate on 2nd Reading. Its House companion, HB 601 by Representative Jim Frishe also cleared its final committee of reference, House Economic Affairs, by a unanimous vote. It is now ready for consideration on the House floor. Within the first week of accepting applications for Hillsborough County’s new small business reimbursement incentive program, three local businesses have already been pre-approved to receive reimbursements, allowing them to hire three new employees each. The program is designed to promote job creation in Hillsborough County by offering a wage reimbursement to small businesses owners. The three local businesses are: Fry and Associates in Plant City, which has been pre-approved to receive $11,700 for three employees; Apollo Beach Air in Apollo Beach, which has been pre-approved to receive $10,400 for three employees; and Absolute Auto Repair in Dover, which has been pre-approved to receive $11,700 also for three employees. The funding will be provided to the businesses after they fulfill the requirements of the program, including employing the new staff for a minimum of three months. The three small business owners are excited about the program, as it is helping them hire employees they needed, but perhaps could not afford without assistance. “We were going to wait and hire in the summer, but, now, we are able to hire now,” said Cathy Kudlinski of Absolute Auto Repair. The incentive program, proposed by County Commissioner Sandra L. Murman, was approved by the Board of County Commissioners on March 16. The reimbursement pays small businesses up to 50 percent of three months’ total salary of new jobs created, capped at $3,900 per new employee. It is estimated that this program will encourage the creation of approximately 200 jobs, offering a total of $500,000 to local small business owners. To qualify, small business owners have to attend a minimum of four hours of business workshops and/or counseling sessions and meet specific requirements, such as having 10 employees or less; jobs created must be full-time and last the required three-month employment period; businesses must have a Hillsborough County business tax receipt; new employees must be residents of Hillsborough County and businesses must be located in Hillsborough County; and businesses may be reimbursed for up to three created jobs. Additional requirements are listed on the program application. Small business owners can download an application and more information from the Hillsborough County Small, Minority Business Development Section’s Web page at: www.hillsboroughcounty.org/econdev/. The applications will be accepted on a first-come / first-serve basis until the program funding runs out. For additional information, contact the Hillsborough County Small, Minority Business Development Section at (813) 914-4028. Sandy launches part of her Job Creation plan for Hillsborough County today. three months’ total salary of new jobs created, capped at $3,900 per new employee. It is estimated that this program will encourage the creation of approximately 200 jobs, offering a total of $500,000 to local small business owners. To qualify, small business owners would have to attend a minimum of four hours of business workshops and/or counseling sessions and meet specific requirements such as having 10 employees or less; jobs created must be full-time and last the required three-month employment period; new employees must be residents of Hillsborough County and businesses must be located in Hillsborough County; and businesses may be reimbursed for up to three created jobs. Additional requirements will be listed on the program application. www.hillsboroughcounty.org/econdev/. The applications will be accepted on a first-come/first-serve basis until the program funding runs out. Media: for more information, contact Commissioner Sandra L. Murman’s office at (813) 272-5470 or Gene Gray, Utilities and Commerce Administrator, at (813) 272-6210. Hillsborough County’s Courtney Campbell Parkway Boat Ramp, on the south side of State Road 60 on Tampa Bay, will be closed to the public on Tuesday, April 12, from approximately 6 a.m. to Noon, to allow the Tampa International Airport and the St. Petersburg-Clearwater International Airport to conduct an FAA required mass casualty exercise. For additional information, contact the Hillsborough County Parks, Recreation and Conservation Department at (813) 635-3500. A new Anti-Graffiti Truck for our County! Commissioner Murman is so thankful for the work of our County Staff who will be helping keep our community beautiful by the christening of this anti-graffiti truck. Let’s get involved in helping our lovely county have good civic involvment. The deadline for applying is Thursday, March 17. COUNCIL ON AGING–advocates on behalf of older adults for the betterment of their well-being and to furnish input to the Department of Family and Aging Services-Division of Aging Services, including the Board of County Commissioners, on matters relating to the quality of life of older adults. One position is new. Term is for two years. Position is specified as a representative of the faith-based community. Appointment to the Council is contingent upon passing a criminal background check. Meeting schedule: To be determined. 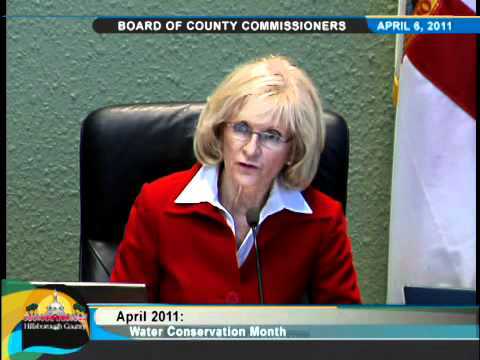 COUNTY INTERNAL AUDIT COMMITTEE–serves in an advisory capacity to the Hillsborough County Board of County Commissioners and to the County Internal Audit Department, on issues presented to the Committee related to the oversight of County audit activities and the performance of the County Internal Auditor. The Committee will also serve as an intermediary between the County Commission and the County Internal Auditor. The Committee shall be subject at all times to Florida’s Government-in-the-Sunshine Law, codified in Florida Statutes section 286.011, and is subject to policies codified in BOCC Resolution R11-011. At least one Committee member must be a Certified Public Accountant, licensed to practice public accountancy in the State of Florida in good standing; and at least two members must possess five to ten years experience with auditing functions. Each member should have an understanding of good management and business practices. • The ability to act independently and be proactive in advising on issues that require further management attention. Five positions have been created. Terms are for two years. Members may not serve more than two full consecutive terms. Members shall not have a direct financial interest in County business. Meeting schedule: To be determined. ENTERPRISE ZONE DEVELOPMENT AGENCY BOARD–implements a strategic economic development plan for the University Area Enterprise Zone. The State-approved University Area Enterprise Zone is generally described as located north of the City of Tampa boundary along Fowler Avenue, south of Bearss Avenue/Skipper Road, and between I-275 and Bruce B. Downs Boulevard. One position is vacant due to resignation. Position is for remainder of term which expires June 30, 2014. Position is specified as a non-profit community based organization operating within the Zone. Meeting schedule: Every other month; at least annually. FAMILY CHILD CARE HOME ADVISORY BOARD–annually reviews and advises the Board of County Commissioners on recommended amendments to the Family Child Care Home Licensing Ordinance and the Rules and Regulations Handbook. This includes recommending and assisting the local licensing agency in the development and implementation of training materials for child care personnel; advising the local licensing agency on matters of licensing policy, procedure and priorities; and proposes additional rules and regulations regarding the intent and purpose of the ordinance. One term has expired and two positions are vacant. Terms are for three years. Positions are specified as 1) a child care providers association representative, 2 & 3) a parent who has a child enrolled in a licensed family day care home. In order to be considered for positions 2 and 3, please notate on your application that you meet this requirement. Appointment to this Board is contingent upon passing a criminal background check. Meeting schedule: Quarterly, third Thursday, 7 p.m.
GAS BOARD OF ADJUSTMENT, APPEALS & EXAMINERS–governs the certification of gas contractors doing work in Hillsborough County and enforces adherence to the standards set by the Gas Code. Three positions are vacant. Member term is for four years and alternate terms are for two years. Positions are specified as: 1) a liquid petroleum installer, and 2 & 3) alternates. Alternate members must be knowledgeable and experienced in the technical codes of this Board. Citizens appointed to this Board will be required to file an annual financial disclosure. Meeting schedule: Quarterly, third Thursday, 11 a.m.
Two positions are vacant due to resignation. One term is for four years and one is for the remainder of a term which expires June 30, 2012. Positions are specified as 1) a participant in the Hillsborough County Indigent Health Care Plan and 2) a non-healthcare business community representative. Meeting schedule: Monthly, third Thursday, 3 p.m. HISTORICAL ADVISORY COUNCIL–supports and facilitates a uniform historical marker program throughout the County, including the cities of Tampa, Plant City, and Temple Terrace as well as organizations and other agencies who request assistance. It also provides the County Commission with support that complements the goals of historical preservation and education in Hillsborough County. One position is vacant. Position is for remainder of term which expires Dec. 31, 2012. No members shall serve for more than two full consecutive terms. More than one half of a term is deemed to be service for a full term. A member who has served two full consecutive terms will be eligible for reappointment after at least three years of non-membership. All members must possess expertise in significant and relevant historical matters. In making appointments, due consideration shall be given to achieving a demographic balance among the appointed. Meeting schedule: Quarterly. Four positions are vacant. Two positions are for three years and two positions are for the remainder of terms which expire Dec. 31, 2011, and Feb. 28, 2012. After two consecutive terms, a member will not be eligible for reappointment until one calendar year has elapsed from date of termination of the second term. Positions are specified as 1) an architectural historian, 2) a layperson with demonstrated interest, competence or knowledge in historic preservation, 3) an alternate who is an architect or architectural historian, a historian, an anthropologist or archaeologist, a planner or landscape architect or real estate developer/broker, or an owner of a historic property listed on the Florida Master Site File, and 4) an architect or architectural historian. Members must have a demonstrated interest, competence, or knowledge in historic preservation. Citizens appointed to this Board must reside in the unincorporated area of Hillsborough County. Meeting schedule: Monthly, generally third Tuesday, 3 p.m.
HOUSING FINANCE AUTHORITY–created in 1985 to provide incentives to the private sector to relieve the shortage of affordable housing in Hillsborough County. Through partnership with lenders, builders, and developers, the Authority has assisted thousands of first-time home-buyers through mortgage loan programs, which offer below-market mortgage rates and innovative down payment assistance programs. The Authority has also assisted renters through its Multi-Family Bond programs, which feature below-market rental rates to lower-income individuals and families. Two terms are expiring. Terms are for four years. Not less than three of the members shall be knowledgeable in one of the following fields: labor, finance or commerce. Meeting schedule: Monthly, generally second Friday, 9:30 a.m.
Three positions are vacant. Member term is for four years and alternate terms are for two years. Positions are specified as: 1) a mechanical trade representative, and 2 & 3) alternates. Alternate members must be knowledgeable and experienced in the technical codes of this Board. Citizens appointed to this Board will be required to file an annual financial disclosure. Meeting schedule: Quarterly, 10 a.m.
PUBLIC LIBRARY BOARD–works with the Board of County Commissioners regarding the operation of the Tampa-Hillsborough County Public Library System, including future planning and policy developments. One position is vacant due to resignation. Term is for three years. Position is specified as a resident from Hillsborough County District 3. Appointment to this Board is contingent upon passing a criminal background check. Meeting schedule: Monthly, fourth Thursday, 4 p.m.
Sandy Test Drives the Nissan Leaf! 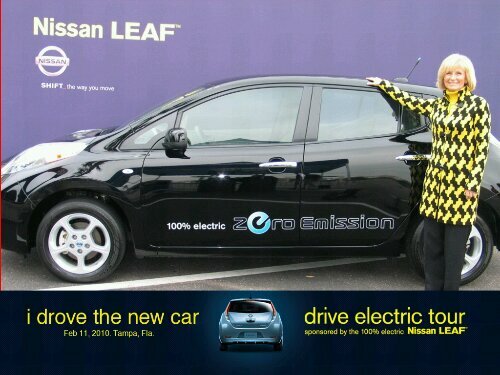 Check out Sandy test Driving a Nissan Leaf at International Mall! Lessons We May Learn from Dr. Martin Luther King, Jr.
Today, as I watched the news – a reporter was interviewing a teenage girl about the importance of Dr. Martin Luther King Jr. and what he meant to her- I was lucky enough to hear her answer, which said that Dr. Martin Luther King Jr. was a great man who understood the importance of improving himself and that the color of the skin did not have anything to do with a person’s character. The pages of our history books are filled with men and women whose actions have impacted the course of our nation. Dr. Martin Luther King Jr. is one of these figures. Forty-Two years after his death, Americans, regardless of race, are still benefiting from the effects of his passionate campaign. As we remember his life today, there are several valuable lessons we can learn. Dr. Martin Luther King, Jr. recognized the importance of improving himself. He was an excellent student, graduating from high school and entering Morehouse College at the age of 15 where he received his Bachelor’s Degree. He continued his studies at Crozer Theological Seminary, graduating with honors. Finally, he earned a doctoral degree in systematic theology from Boston University. Ironically, some of his worst marks at Crozer were 2 courses on public speaking. Those professors must feel a little like the junior varsity basketball coach that cut Michael Jordan from the school team. Leaders use setbacks to motivate themselves to improve. There is always room for improvement. We need to follow his example and look for ways to better ourselves. Dr. Martin Luther King, Jr. was an involved citizen. He found a cause and became an advocate for that cause. He saw the injustice of racism in the South and looked for ways to make changes. He got others involved, using both white and black sympathizers in the North to help fan the fires of change. He knew the risks, yet stayed true to his convictions. Today, there is still a desperate need for doers. We need public servants and people to look around and see things that need to change, and then make a commitment to change them. 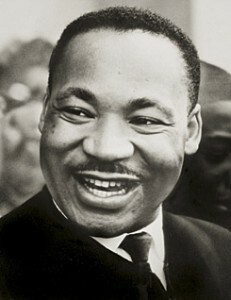 ” I have a dream that one day this nation will rise up and live out the true meaning of its creed: ‘ We hold these truths to be self-evident, that all men are created equal.’ … I have a dream that my four little children will one day live in a nation where they will not be judged by the color of their skin but by the content of their character.” Exactly what the young teenager spoke this morning. Because of this dream, America is a better place today. There is still more progress to be made. I can think of no better memorial than to carry forward his message of unity, and love for our fellow man to our children. A young girl attended a holiday violin recital. She was so captivated by the beauty of the music and powerful presence of the violinist she absolutely had to meet him after the performance. She waited patiently in line to greet him, and when it was her turn, she said hello and asked if he would please autograph her program. “Well,” said the girl, “my hands are tired, too, from all the clapping.” The violinist beamed and with a flourish, autographed the program. I sing the praises of professionals, business leaders and community volunteers, parents and grandparents. You are the violinists for children, families and our elders every day throughout our vibrant and diverse communities. We who care for our own families and the loved ones of others master the notes, touch the strings, and move the bow creating beautiful music. And sometimes we get tired. I am your admirer, honoring your commitment and applauding your efforts. Together, in partnership, we are making progress. Let’s never forget that we are needed; let’s not lose hope nor allow one day’s fatigue to dampen our spirit. The challenges are great, but our optimism and strength of commitment will persevere! My special wishes for the holidays go to our military and their families, our first responder law enforcement, EMT and fire-fighting professionals, health care-givers, educators and providers of other vital human services whose dedication seldom takes a holiday. They are there for us and stand ready to serve in good times and bad. Saying thank you to these people is one way of giving them the emotional boost they need to keep up their good work for us all. 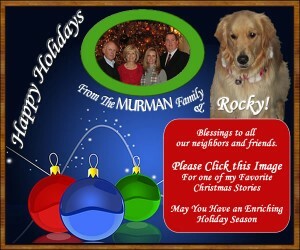 Jim & Sandy, Michele & Michael (newly engaged) and Rocky too! – To yourself….respect, confidence and faith. – To a friend….a heartfelt and caring spirit. – To a family member….dedication, communication and understanding. – To our natural world….protection and preservation. – To a good cause….generosity and ardent advocacy. – To a traveler….an open door of hospitality. – To our military and first responders….honor and appreciation. – To a customer or client….excellent service. – To the ill and hurting….concern and healing comfort. – To the hungry and homeless….compassion and emergency services. – To the abused, neglected and abandoned….hope and security. – To someone with a special challenge….recognition and acceptance. – To the addicted and troubled….a positive path to recovery. – To an infant and toddler….attachment, attention and safety. – To a child and teen….patience, guidance and a good example. – To a parent in need….a helping hand. – To an elder, reverence….gratitude and dignified care. – To everyone you see, friends and strangers alike….a smile and positive energy. – To people of every age….unconditional love. – To all the peoples of the world….justice and peace.